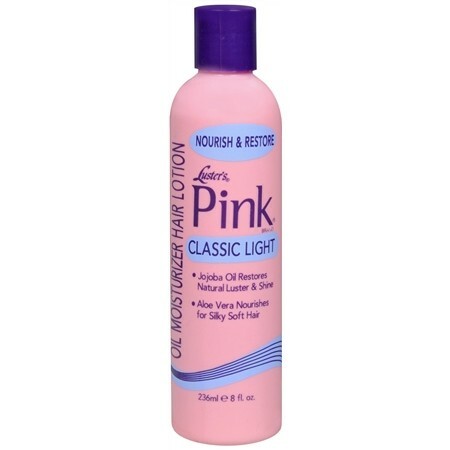 Luster's Pink Classic Light Oil Moisturizer Hair Lotion 236ml. This product is formulated with Aloe Vera to restore the hair strand with moisture and nourish it for improved elasticity and less breakage. This unique formula is also made with jojoba oil to soften and silken the hair without greasy, oily build-up. For hair that is healthy, shiny and when styling versatility is a must, Classic Light is the perfect solution. Pour a small amount into palm, rub hands together and apply to hair daily or as needed. Comb or style as desired.